Statistical evidence shows that millions of children all over the world miss out their childhood due to extreme poverty. Bangladesh has been making steady progress in a number of social indices including health, human development and education for a few decades. But still there are around seven million children aged from 5 to 14 engaged in child labour to help their family survive. Desperate situation needs desperate measures, thought a group youths who formed an organisation named "LUMINARY" (the hope, the inspiration). It has been working relentlessly to facilitate the unprivileged children with a mission to make the world a better place for these fortuneless children. The word "Luminary" stands for "source of light”. The organisation started its journey in 2015.The pioneers are the students from Department of Business Administration of Noakhali Science & Technology University. The organisation endeavors to facilitate the unprivileged children, provide them with proper education and also help them nurture their potentials. Luminary basically tries to nurture the children around the university campus. The members of the organisation devote their free time during weekend to educate these children. Throughout the process they also realise the necessity of education to become a better human being. At times members are required to go to the parents of the children to convince them to send their kids to school or madrasa. Alongside regular education the organisation teaches the children about the life skills such as physical hygiene, better nutrition, how to cross a road etc. Occasionally, Luminary arranges cultural programme, sports competition and children film festival. Free books, writing aids, medicine and Eid presents have also been distributed during festivals. They are also given free food during weekend. To make the children realise about the importance of tree plantation, saplings are also distributed among them. Currently there are 30 members in the organisation striving to change the course of life of 70 playmates (unprivileged children) for a better future. Luminary wants to make sure that a school-going child shouldn’t drop out because of poverty. It motivates the playmate as well as their parents so that a child can continue his or her study to build a bright future overcoming all challenges. The vision of the organisation is to work for the children throughout the country and all around the world. Within a very short span of time, Luminary is growing vigorously and hopes to bring positive changes to the society. "We, on behalf of Luminary, are striving with a view to removing the darkness of ignorance from the coastal of Bangladesh by igniting the eagerness of learning among the deprived and backward rural students of Southern Part as well as ensuring that not a single one is falling behind due to financial crisis," said Tazrin Jahan, General Secretary of Luminary. 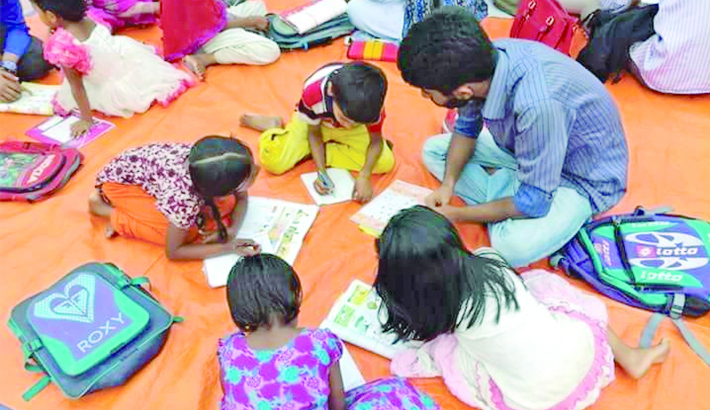 President of Luminary, Farhadul Islam says, "We are very glad to be able to work for the underprivileged children through this voluntary organisation. These children have started to know themselves. They have realised the importance of being educated. They are now inspired to have academic education. Besides academic education, we want to educate them ethically that will be helpful for their mental development. Luminary is such an organisation that provides them ideas about practical life. We want to prepare them for the upcoming battle of life and give them a good future." He said, “The members of this organisation are taking class, arranging different cultural and competition programme, and sharing different motivational stories. I feel proud to be a part of it. I wish them success in their all steps."